We do well to see through maps, Denis Wood enjoined, urging us to detect the “human landscape” that lies superimposed upon the land in maps, and uncover the ways that the landscape has been changed–and orient ourselves to those changes that have been wrought by the “huge arrogance” that “we can name and we can claim.” Maps demand to be interpreted by scratching their surfaces, aa task of uncovering how one might best “see through them,” to explore the landscapes that lie underneath the layer of words that lies on their beckoning if often all too opaque surfaces. To take stock of how maps work by asking us to go about imagining the landscape that lies beneath those words is a way of uncovering their arguments about territories. Few maps invite their interpretation, but a recent sound-map of the rivers that run underground the city of London cunningly uses the conceit of Harry Beck’s famous underground map, modeled on a circuit, to help us excavate the rivers that run beneath its paved surface, and does so by shifting sensory records of mapping by asking us to hear sites of the underground canals that run beneath the city’s pave roads: in a staged synesthesia, we are invited to click on imaginary stations in a Beck-like circuit map to hear the rivers that run underground the city at select points they can be accessed or emerge. If Beck presented the Underground as a circuit to grasp its path as an alternate commuter route around the central vein of the Thames river, the London Sound Survey links audiofiles at points where we can eavesdrop on the pathways of water that enters the Thames from hidden channels largely lying underground, in a parallel path of water flows. One might compare to this set of maps the ways in which maps in the London Sound Survey invites readers to enter an overpowering pointillist accumulation of local details, and similarly serve to map a setting in which everything sings–or at least we can enter its audible surface at distinct points. 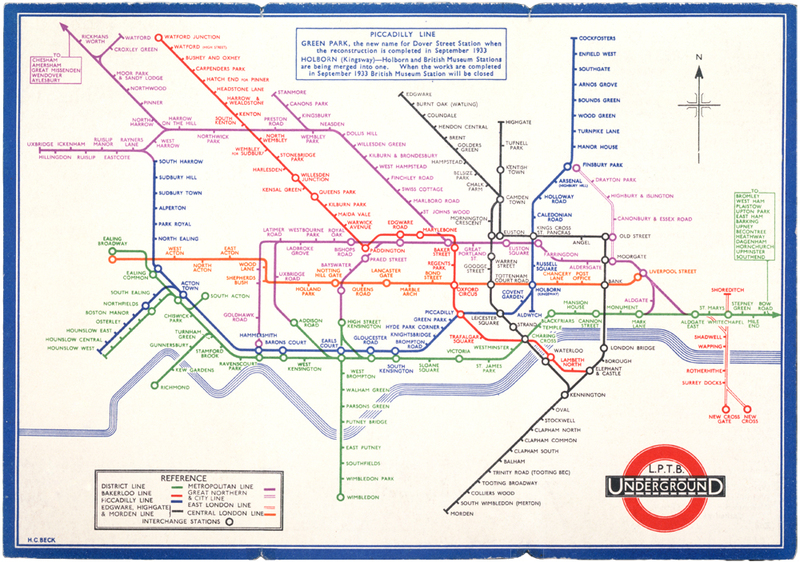 The question of what axes indices and axes might be adopted to best orient readers to the ways that the place works are ingeniously organized by the Sound Survey through the colored lines and stops of the transit map that Harry Beck proposed for London’s Underground in 1931, a network-map whose revolutionary simplicity seems to have been devised when the draftsman in its Signal Office, Beck adopted paths of circuits to map the intersecting pathways of the Underground at a time when the city needed to encourage less traffic in its streets: the powerful success of Beck’s map shifted Londoners’ attitudes to urban space. 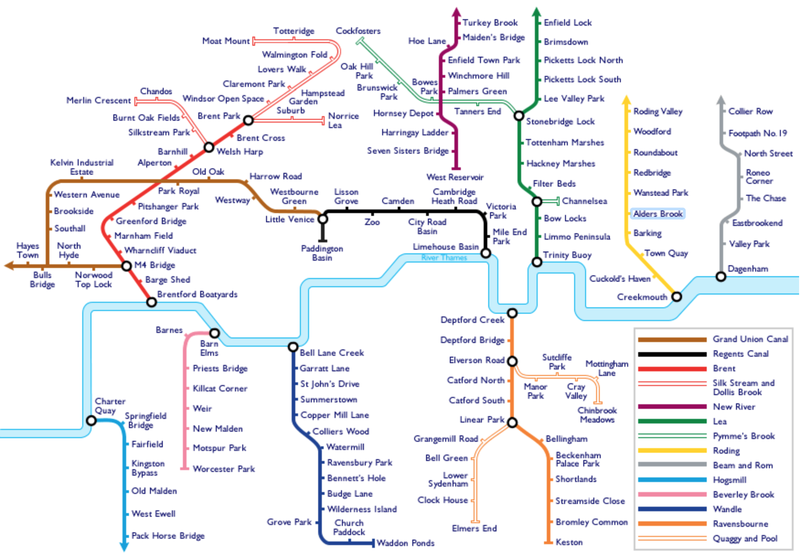 A rewritten version of the familiar iconic network of the London Underground appropriately provides the syntax to uncover the hidden network of non-tidal streams, brooks, creeks, pools and channels that run, partly exposed, partly underground, around the river Thames. Territories are less the question in the map of London’s waterways, which progress from trickling streams to waves slapping against the locks of the Thames. The result is to conjure not a mythical, lost London, as did James Shepherd Scott’s 1884 History of London, a work concerned to show “the origin and growth of the present condition of the suburbs” of what was the “largest city of the world,” but which began with the tabula rasa of “London Before the Houses”–with two streets running about marshy region in a network of rivers–but to remind us of a watery network that still lives under the city’s paved streets–even though it also echoes Scott’s illustration in recreating a London that is now lost to the senses for most readers. If Scott’s map served as the frontispiece for a volume that described the city whose growth has been “very rapid in modern times,” and “an ever-widening tract of country covered by the buildings of a city already so large that it is equalled by no other in the world” (1), the cosmopolitan metropolis is excavated in the map of the London Sound Survey. While Scott mused that “as the houses advance, the natural features are obliterated,” and, at the conclusion to his list of changes, “the brooks no longer run” (2), the survival of the brooks and streams as vital parts of a living landscape are documented in the qualitatively detailed survey’s sounds. In charting paths of the waterways hidden even to London’s own inhabitants, the sound map is especially successful in charting the dissonance between the forms of symbolization and lived experience–and by doing so through the conventions we immediately recognize as indicating London. While imitating or offering a cartographical homage to the Underground map, the surface of the map is punctuated with sonorous glimpses of the lived space of London today–offering actual stops where we can pause to hear a sound file of a minute or so of the water that trickles between it can be heard from the surface, in evanescent moments the symbology of the map cannot hope to record created by rivers, feeder streams or brooks, and canals. Each “stop” is an observation station–to perceive or note the gurgling of a brook over a weir near Wimbledon or follow the course of the Brent through a culvert and along a viaduct, beside ambient noise of work, honking geese, and quacking ducks. That the rivers don’t exist makes the map a recuperation of how London lives beside the water today, and to attune oneself to its changing environment in which the tributaries of the Thames are more often trickles than rapidly flowing streams. While dismembering Beck’s circuitry, the paths of rivers, streams, and waterways that flow into the Thames are something of a melancholy look at a world we have lost, but also a snapshot of their survival in an urbanized environment. 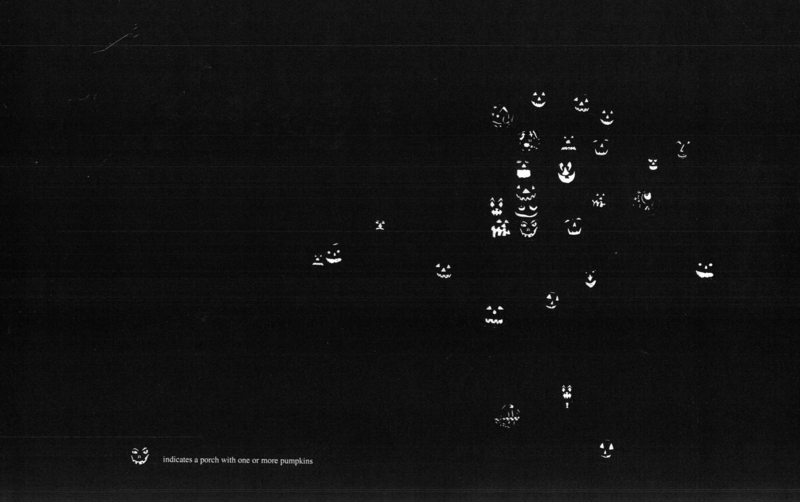 The cartographical poetics of the Sound Survey map are immediately recognizable. By adapting the iconic conventions Harry Beck pioneered in his immensely popular modernist mapping of the circuits of metropolitan transit in his 1931 Underground map, the map needs no identification of where it is–London–and provides something of a counterfact of an image that today is separable from the city, despite its considerable influence as a model of mapping transit networks. 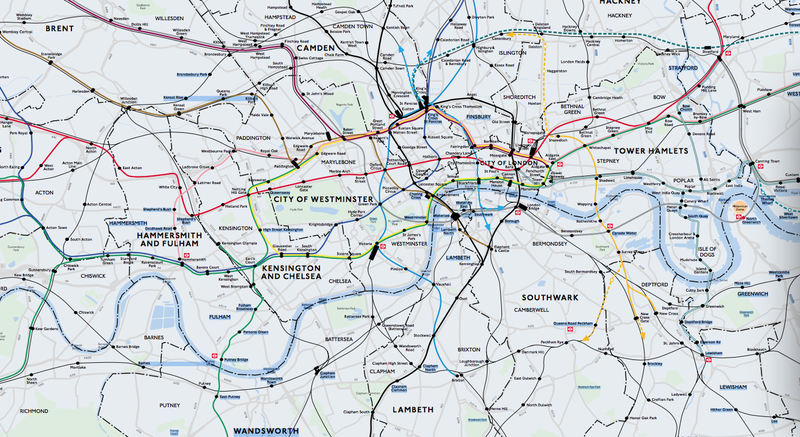 The map’s almost-universal influence on how metros are mapped in urban landscapes has not altered the distinctive iconography of the Underground map: its conventions establish a quite different perspective than orienting readers to its built underground, however, as it used similar streamlined conventions and colored lines to trace the paths water takes in London’s built environment. The conventions invite readers to explore the topography of where water rises to the surface of the urban space: by clicking at the site of any “stop,” to link to audio clips along the indicated waterway, marked, as trains, by curving colored lines almost identical Beck used to diagram the city’s Underground–yet rather than create a unified network, they trace currents that flow into the Thames–the river that runs through London, and sole point of external reference in Beck’s now-classic modernist map of the London Underground. Ian Rawes has long recorded London sounds to preserve its sensorial world; the map of waterways allows us to enter aural environments at parts of the city by a smattering of precise sensations of water passes whose collective accumulation overcomes its readers: while mapped as if a site of imaginary metropolitan stops, the stops are in fact spots where waterways aside from the Thames are audible to city-dwellers, as if to synthesize insider’s knowledge how the urban space overlays an unseen web of currents, exposing them in a map as Beck foregrounded the space of transit lines to orient urban travellers. When London Sound Survey mapped the city’s hidden urban waterways, it used data from observation stations to revisit formerly overlooked spaces where water emerged, at least aurally, in the city. These sites are rarely mapped, but the interactive audio files allow users to hear sounds of a watery web which one might have earlier recognized. Each observation site appears evanescent moments at scattered sites in the city, but reveals, as a sort of historical base-line, the levels at which water flows through multiple sites in the built environment. The website gestures the organic notion of the flows of circuitry in the Beck map–now iconic–around the flow of the Thames, and perhaps, by orienting itself to the Thames River, so different in its smoothness than the hyperactive transit maps of Japan Rail in Tokyo, whose integrated circuit seem spectacularly stripped of reference to physical landmarks or phenomenological relation to the world. When Ian Rawes sought to encode over 1,500 discrete recordings in the London Sound Survey but in plotting the courses of the audibility of otherwise-hidden waterways plots, the Survey organized what seem curiously subjective perspectives to map what can be heard at different sites in the space of a single map of the hidden streams that run through the metropolis; the act of apprehending the submerged underground network is pleasantly reorienting, focussing our attention on where they reappear and intersect with birdsong, dripping waters, passing individuals, or local sounds of construction and transport in the city: the discrete sites assemble, collectively, both a map and an aural environment that most maps)cannot capture. Each discrete sound seems impermanent, but also suggests, collectively, the ways water briefly reappear in a built environment, as rivers, streams, and canals enter lived life in ways not detectable on an actual map. At each “stop,” we enter an observation-station where Rawes recorded the ambient sounds around waterways. 1. The resulting mapping of the soundscape of London’s waterways offers a multiple points of entrances to soundscapes outside the city’s built environment. The permanence of the pathways of canals, rivers, and underground waterways rightly map of the sounds of the system of waterways as intersections with a riverine underground. Explicitly designed as an “auditory tribute” or homage to the circuit-like color-coded design of Harry Beck’s modernist map which clarified complex pathways of the tube for commuters earlier only “about as legible as a bowl of spaghetti” for its riders. Beck’s draftsmanship elegantly schematized the pathways of London’s Underground to allow their legibility in an icon not only of urban transit but accessibility, but of the city itself: at a time when the city’s subway had become so geographically far-flung to be a challenge to condense to a legible fashion, the map effectively persuaded commuters of the ease of navigating its totality, while living in its suburbs, by mapping the pathways of its trains by angles at increments of forty-five degrees to increase their legibility, and foregrounding its interchanges. Ian Rawes cleverly adopted the diagram first designed to promote a readily legible record of commuter rail, by straightening out their course and contracting the distances at regular intervals to allow aural access to sound files through a web-based interfaces. Whereas Beck’s intent was to expand the utility needed in a transit map for audiences in ways that riders to navigate its multiple lines that was readily appreciated by riders, Rawes’ map is an opportunity for noticing the overlooked, and invite them to follow the paths with which waterways intersect with other lived environments. The cooing of pigeons and drips of water under the Greenway bridge at “Channelsea” off the Lea complements the hum of traffic overhead, as if an epiphany of the evanescent; the passing train near the Roding at “Alders Brook” suggests a moment watching passing urban traffic on a viaduct, as the trickle of water at “Paddington Basin”–not Paddington Station–almost concealed by the loud whirr of air-conditioning units and an intermittent power-saw from a nearby construction site. The Brent flows under the observation station “Greenford Bridge” pierced by the referee’s whistle at an amateur football game mixed with players’ cries. The registration of lived experience sets something of a watermark on the sounds of London circa 2012. The physical expanse of Rawes’ aural map is an a propos homage Beck’s diagram. The soundscape map reveals the similar permanence of overlooked waterways that link to the Thames. By collating short sound-files at points where they emerge from the built environment, preserving a uniquely personal reaction to place of the sort that often eludes city maps. Where Beck preserved a mental image of the sites at which access to the London Underground was permitted, at a user’s click, a range of ambient sounds peek through the observation points noted by the stubs with which Beck rendered Underground “stops” in his iconic map. Beck’s map was immediately popular among commuters as a way to re-render the urban space. It has since gained such sustained popularity as a model for similar subway systems–it encouraged urban expansion in Sydney (just eight years later) and encouraged Beck to submit maps for other cities’ transport systems in future years. Indeed, the image has become so a successful a symbolic rendering of London’s space for its conventions of colored lines and combining of circular hubs of interesecting lines with stubby stops to orient access to London’s underground. By using the streamlined circuit-like conventions by which Beck had oriented riders to the expanding Underground and navigate their commutes, Rawes recuperated the lost sounds of the city’s waterways as if to remind readers of the distance at which they stand from them. The Underground map was, of course, famous as a remapping of urban space, as much as an icon of London. The diagram placed stations at a remove from actual distances or locations, but replaced an image of the actual geographical relations in the city by highlighting their routes on clearly colored paths that run in uniform lines to prominently render interchange stations, filtering out any reference to the city’s physical topography save a quite schematic rendering of the Thames; the image was quickly affixed to every station on account of its highly readable ways by which it oriented city-dwellers and allowed them to gauge the crucial question of the number of stops–rather than the actual distances–to their destinations. If Beck’s map collapsed space, the map of waterways orients readers to the transit that water took across its expanse, in ways that seem irrelevant to spatial geography. Beck straightened the river’s course in the name of clarity in his diagram, in line with the straightening of trains’ routes for readers to allow them to better visualize routes of travel and the exchanges they would need to make. Such is the conceptual clarity and considerable staying power of Beck’s diagram to navigate London’s underground makes it in fact quite difficult to view the actual pathways taken by Underground trains–yet Beck’s system of reference remains so powerful a symbolic form to conceptualize London’s Underground that it is disorienting to be presented with the actual courses train lines truly take in the city. 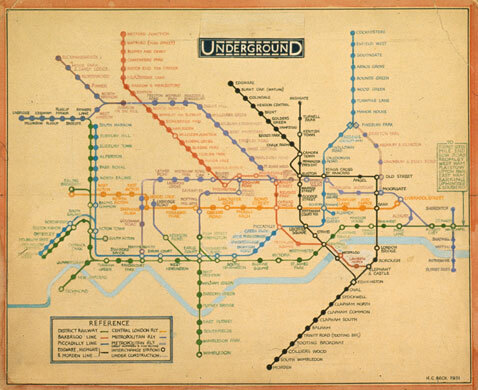 As a symbolic form of what Rudolf Arnheim called “visual thinking,” the diagram encouraged Londoners to take to the Underground as a way to navigate their commutes or daily travels with such success that an actual groundplan of the interface between the individual lines and the city’s space seems disorienting in how it reveals the meandering pathways that train lines actually take, the actual sinuous curves of the Thames, and the apparent failure of trains to turn at increments of 45° along their true courses. We are far more ready to map the familiar transit lines displayed in a reference key and shown in the maps by pronounced paths of colors, as a network that existed as if autonomously from the city, to better find what he called its interchange stations. The notion that the network was made up of discrete lines proved immensely influential in all later transit maps. Beck’s streamlined routes of the diagram offered Rawes a quite fitting medium to map each waterway’s aural settings at observation points. 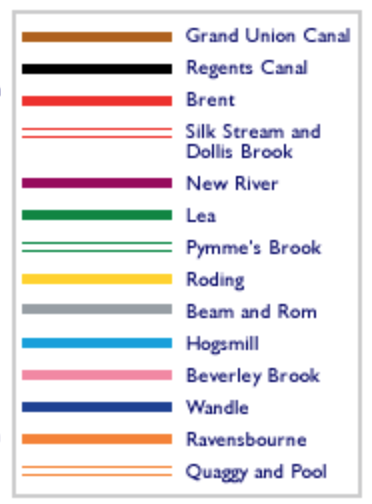 Each “station” presented readers with a chance to look under the map to hear the sounds that peer out from it, at a click: linked sound files map unmapped–and perhaps often forgotten–waterways from the River Lea, Wandel, Roding, the New River, Brent to Beverly Brook. Rawes’ legend link multiple listening stations, linked on a similar spectrum of color-coded lines to orient viewers, even if each sound-file disperses one’s attention to the city’s surface in way that are wonderfully unlike the fixity of Beck’s coherent system–the map individuates specific points where readers can descends to join not the Underground lines, but watery courses below an inhabited surface. Each waterway is assigned a uniquely colored path that approximates the hues of the current Underground, and are given the names of the actual waterway, transposing the natural and the man-made. Beck’s diagrammatic streamlining of the Tubelines provided an apt set of conventions quickly identified with underground transit routes of built conveyances. He used them to chart hidden points at which the constellation of urban waterways intersect with the city’s lived environment. The resulting soundscape map situated the emergence of waterways in the city. The result is to suggest the points at which an otherwise hidden network of waterways reveal themselves in the soundscapes of docks, bridges, marshes, creeks, reservoirs and parks that we so often consider the built city to have replaced. Pushing this avenue of investigation, Rawes invites readers to revisit and investigate a hidden network of waterways running under the city that are hidden from the familiar map’s surface. In a metageographical terms, Rawes’ sound-map acts as a comment on the folly of conveying an actual level of continuity to the quite specific sites where water appears to be heard, and the relation of the transit of water in the city to the historically built means of transit–from traffic to the sounds of footsteps, joggers, walkers, the drone of airplanes, industry, or as well as ambient birdsong–and allow the unique poetics of an imaginary landscape to emerge that results from the situation of London’s actual hidden waterways. To be sure, the role of the cartographer is as a disinterested observer–Rawes preserved this role, it seems–but offers archivally dated sound files of each place that the reader can savor in one-minute clips. 2. The river, of course, runs through it. The London Sound Survey of Waterways present a palimpsest of urban topography. The location of the individual urban soundscapes offer a counter-map to urban space, exploiting the ways in which online maps invite us to go beyond this reading of the imaginary in an eery way. By linking the mapped space of the city in an almost joyously synesthetic fashion with urban sounds, the sound survey of London’s waterways provides a way of tracking urban experiences around is hidden waterways, suddenly bringing them to the surface from the very tools of mapping London that are perhaps the best known. By inventively embedding sound clips of tickling rivers, birdsong, traffic, droning of substations, cries of gulls or terns, trains, and even boats on the Thames, we see the city in new ways that recreate a map with an almost subjective intensity that is almost always inherently absent from a map’s face. Suddenly–unlike the original–we find the waterways of the inhabited city peeking into the stylized format of Beck’s transit map, as the submerged riverine paths are given a prominence most dwellers of the city ignore. Beck’s diagram of the Underground intentionally abandons scale or correct proportions for regularity and apparently straight lines in his own schematic rendering of waterways. Beck’s aim was to produce a quite stylized format to grasp facilitate urban communication and both plan and recognize routes of commutes. The immediate success of Beck’s formal innovation of how to mediate he underground to its passengers of course now offers not only an icon of London, but served to helpfully map the city’s physical space, even while the diagram sacrificed exact spatial correspondence or measurements: indeed, many visitors to London are regularly reminded to disregard the plain distortion of the Underground map, much as visitors to New York may need to be reminded that the walking distance between apparently nearby stops is greater than the map implied. 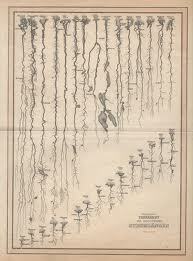 Beck diagrammed the Underground as a record of routes of transit not corresponding to their spatial organization. 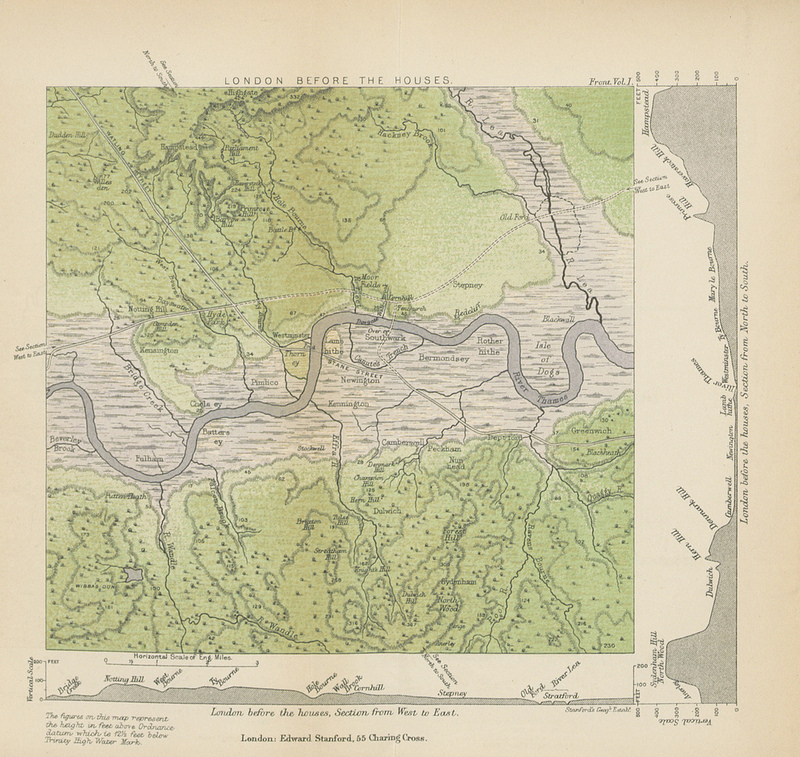 Rawes invested similar regularity to the waterways that fed the River Thames, which he gives a prominence in his map, to which each of the waterways linked, though few have commerce with one another: if Beck streamlined the Underground lines, Rawes “Beck-ified” London’s waterways to better distinguish a network of streams hidden from public view and register their sounds, often overwhelmed by ambient noise. Beck’s diagram of the Underground nicely lends its recognizable structure to tracking the submerged waters of the rivers in ways that one can explore their relation to city sounds. Sounds are removed from the graphic purity of Beck’s modernist design. A barely concealed aspect of Rawes’ homage to the draughtsman who designed the Tube Map is no doubt that Beck symbolized the Thames to appear innocuous in the Underground map–orienting viewers to the paths of rail-lines of commute that link London’s previously quite discrete neighborhoods, but which echoes the apparent straightness and gently curved lines of laid track, and, reduced to a light blue abstraction, recedes into the visual background of the mapped field and is, in fact, no longer an obstruction to movement. In Beck’s map, the Thames’ pale blue almost sinuous curves are only as a sign of spatial reference. In sharp contrast, the River Thames is ever-present as one approaches at different basins or boatyards, the irregularity of the canals and lesser rivers are shown as similarly stylized lines on which the viewer can use to click at a range of sites–rather than stops–to find a range of epiphanies manqués that underscore the incompleteness and selectivity of the map–or any map at all. In the Sound Survey of London’s waterways, the ways that Beck translated the network to terms passengers might best negotiate relinquished geographic accuracy, but became a basis to negotiate the city’s geography: the presentation of the clickable map of urban soundscapes of water offers a counter-map of the city, and allows the online viewer to indulge in the multiple dimensions of the natural settings in which the track of the city’s Underground was built–and the sites of confluence of natural and man-made in today’s city. If Beck’s image was quickly affixed to every station as a shared model for orienting city-dwellers to trace their paths of commute, the success 1931 printed map provided a framework whose popularity has endured, because of its remove from the city’s lived landscape, its interchange stations set against a blank white background to ensure its greater legibility by commuters. There is something truly telling in that the map was commissioned to reduce the intolerable and untenable density of foot-traffic on London’s streets. 3. The sounds on which one click fill the diagram of waterways with an immediacy unfamiliar to maps. In way that transforms viewers’ relation to the city, Rawes’ counter-map re-purposes the stylized simplicity of the lines of transit to show the proximity of the waters to urban settings: the map focusses on waterways relegated outside the underground in Beck’s diagram. The insight of preparing a set of lines that oriented viewers to how lines link to one another–more than the urban streets above–to suggest the autonomy of the system into which Londoners’ entered, as limiting the lines of rail to angles of forty-five degree increments, indeed oddly naturalized the streams that commuters would ride along and across the Thames: Rawes organized his record soundscapes on rivers that followed as they entered its path. The urban observation points, if rendered by Beck’s symbolic conventions, offer a distinct system to orient oneself to the map’s surface–in far less pointedly utilitarian ways. While Beck’s map presented cues by which the train-passenger can orient themselves to the landscape of London in tacit fashion, in order to better orient themselves to its non-exact spatial scale, the city is absent from the diagram. One function of the map is to place oneself in a close proximity to the water–on bridges, by viaducts, on a quay, by a lock–that can rarely, if ever, be recreated in a static map or web-based map, as well as to a complexly variegated aural environment of birdsong, workmen, planes, and passersby. Viewers of the London Sound Survey can be immediately transported, by one click, to relate to the city’s space in distinctly news ways–and a wonderfully synesthetic manner that few maps are able to offer, inviting a perceptual world into the map that defies its oculocentric organization as a surface that is only scanned. By clicking at a toponymy quite unlike that of Beck’s classic map, one enters a sonorous site whose power almost asks one to resist the city as a cohesive collective and focus on moments of the transcendent. For we are struck by a barrage of closely observed sense-based observations, on a gamut of individual sounds cumulatively overwhelming as site-specific perceptions of London’s canals, rivers and streams so as to reveal a “sweet inland murmur” that echoes the revelatory manner that the Romantic poet William Wordsworth evoked, while returning to its banks of the River Wye that he had often remembered as “a landscape to a blind man’s eye.” Wordsworth’s elegant formulation of the sense of transport as he stood “by the sides/ of the deep rivers, and the lonely streams” led him to apostrophize the “sylvan Wye,” whose sounds seem a form of local transcendence, as a place of blending perception and creation–a pastoral whose “tranquil restoration” lies not only in the perception of waters “rolling from their mountain springs,” but a recognition how at their sound “the picture of the mind revives again.” Could a map offer similar restoration? One does not perhaps feel the same ecstasy sort of transport Wordsworth had described at each minute of sound, but all transport us to another place, and to conjure the flow of water beneath the map. 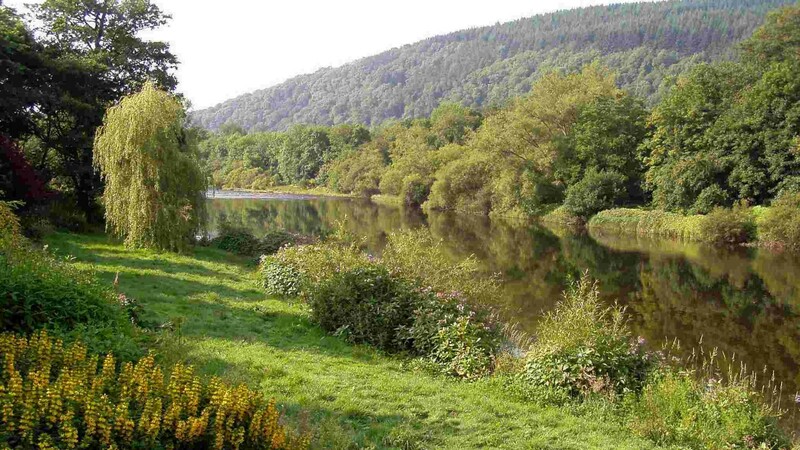 Each station force one to sort out the flood of discrete sense-based perceptions that one registers with immediacy; Wordsworth described being overcome by the sublime of “sensations sweet,/Felt in the blood, and felt along the heart” in Lines Written a Few Miles Above Tintern Abbey (1798). The sensations its sounds and sights provoked he knew well, were re-felt as he saw it again as if for the first time. Although few observation stations in contemporary London offered the opportunity to “hear the mighty waters rolling evermore,” individual “observation stations” offer points of ingress to hone in on places absent from Beck’s map, to access a similar “sweet inland murmur” of waterways and city sounds. In an age of global warming and the recession of ocean waters, and when the water levels of major rivers have dropped worldwide, it is not that one arrives at a redemptive sublime beneath the map of Wordworthian proportions by listening to the sounds of London’s waterways, or takes stock of being newly attuned to one’s past memories of a sight and placebut that the lived city appears, through the sounds, to one’s mind. As the names of pseudo-stations in the Sound Survey’s version of Beck’s map provide names linking to Rawes’ sound files, auditory perception is linked to place through the magic of the map in ways that seem a sort of local sublime. Clicking on stations not only orient readers to place, but transport readers to a mental image of a glimpsed landscape, if in pointillist fashion: each offers a revelation of the traces of the waterways that fed the Thames or canalized water in the city. The salient waterways and canals are suddenly made evident, and able to be traced, below what we usually consider the city’s physical plant. And as the reader encounters equivalents of the “sad music of humanity,” the cries of adults and footsteps of passersby, moving both in and out of the water that flows around the city and birdsong about its canals, rivers and streams: the “stations” conjure the sounds urban inhabitants might have once recognized, navigating its rivers as they run through and reappear in parks, channels, reservoirs and zoos. The pathways taken by water in London are rendered by the standardized conventions to order the aural environments of the birdsong, bubbling brooks, or the dripping water in London’s creeks and minor rivers effectively pierce the smooth and streamlined diagram of Beck’s modernist circuit-like symbolization of the Underground. They allow us to engage with the sound world that Beck’s map intentionally omits: one hears rushing water of the River Lea at “Pickett’s Dock”; faint cries of seagulls at “Camden”, before a train intrudes as it enters Euston Station (not on the map); bird song that arrives from the aviary of the “London Zoo”, with a magpie chattering, adult coots heard in the Reservoir at “Welsh Harp”; “Paddington Basin” (not station) is dominated by the sounds of air conditioning units and powersaws–and puts the sound of trains, traffic, footsteps, human cries, or construction that are heard in the background, as if intruding into a sound environment, as well as being part of it, allowing one to imagine a landscape peeling away layers of history with insouciance for viewers lucky enough to click there. At a click, an aural experience of the lived world of the city emerges from the map as if leaks out of the surface that Beck’s iconography leaks out from the map’s surface. Each small sound clip transports one to a sense of place that unfolds in one’s imagination with a physical clarity that is altogether absent–and indeed banished–from Beck’s more utilitarian (and sterile) transit map. The sound clips transport one to specific sites, rather than allow an infinite number of itineraries to be traced by multiple users, but allow one to explore the city’s aural dimension through a visually and symbolically similar map. The map invests discrete moments of specifically noted times with new meaning as a collection–and suggest less of an inhabited city than ambient sounds most city-dwellers in London be apt to neglect, which would undoubtedly never be noticed if they had not been recorded. Indeed, the transient sounds of a world filled with water offer a sense of tactile contact with the place described, through a map, that at the same time, unlike a map, suggest the evanescent nature of place, and its fragile beauty. At this point, the map is a map, but it is also a portrait more intensely immediate than any map can be: in the medium of the internet, the immediacy of this map lies in its non-visible parts, which take one down passageways unable to be depicted on paper. Once one gets rid of the cellulose embrace the interface, the flimsiness of the static designation of place–even the not so well-known places in the Sound Map of London’s Waterways. As Mutton Brook flows nearby “Hampstead Gardens”, one seems to be knowing the place with a far more acute immediacy than any name could offer. As one clicks the map, the sounds recorded on specific dates acquire a timelessness. And one experiences, after repeated clicks, an eery impression that the selected sounds seem chosen so randomly to make one aware of the omission of any information in a map–and the mechanized nature of the possibilities of interaction that the map offers. This argument may press the notion of the poetics of cartography to a further degree than the London Sound Survey intended, but it hardly seems a coincidence. Life falls out of the map, in purely auditory form, and map a gap between the map as construction and the lived cityscape. The minute-long intervals of cascading of water one encounters as one walks beside the Wandle in South London, coots in North London, the Ravensbourne at “Bromley Common”, the faint roar of the Roding at “Woodford”, River Beam at “The Chase”, the trickle of the pools at “Lower Sydenham”, punctuate the monotony of the static form of a printed map, and indeed dramatically shift our perceptions of space: we hear a car moving, hear voices of adults or children in the background, but these glimpses of the day-to-day offer a sense of the stability of the experiential, in ways that few paper maps can ever do. We are not actors who determine this environment, than we are passing through it to appreciate it. Its given names were assigned by humans, but those names, for a moment, actually seem completely beside the point. The balloonist Joseph-Louis Gay-Lussac, who set a record for ballooning of 7,016 meters in 1804, beside the Himalayas in a balloon, in Andriveau-Goujon’s 1834 Tableaux Comparatif et Figuré (Paris, 1834). The ballooning record Guy-Lussac set long endured and was only broken in 1862. The crisp condensation of an array of multiple mountains and rivers by their magnitudes in a uniform scale and imagined plane represents an image of the coherence of scientific knowledge by its transformation of nature into a single reference tool. The etched “comparative map” reveals an exquisite conflation of legibility and the cartographic surface: it contains not only a database of Humboldtian proportions, but information about the nature of the world’s tallest mountain ranges, volcanic eruptions, longest rivers, and even some waterfalls in Peru–although not the waterfalls in Yosemite, which were not yet discovered or surveyed, or Andes. Containing, and finding a unique way of dominating the increased expanse of the natural world, the popular comparative chart of rivers, mountains, and waterfalls of the world first printed by Bulla & Fontana in 1828– based on Darton’s far more stodgily titled “New and Improved View of the Comparative Heights of the Principal Mountains and Lengths of the Principal Rivers of the World” (1823)–offers more than an episode of cartographical entertainment. 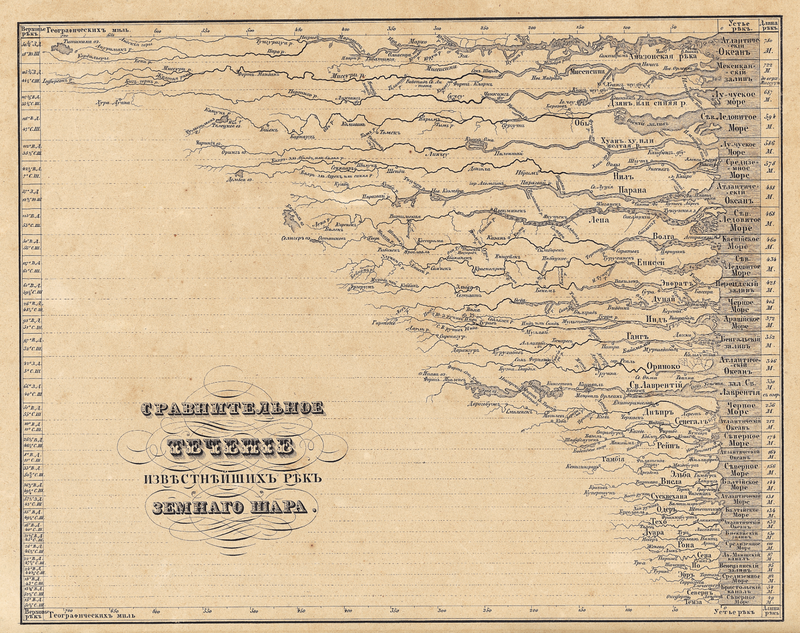 As it was redesigned to accommodate increased information and encompass a greater global purview in its qualitative imagery, the map became something of an assertion of the unboundedness of post-Napoleonic levels of global knowledge, and a celebration of data. Encyclopedically growing through the complex 1834 chart of Andriveau and Goujon celebrated the addition of new claims of knowledge as a domestication of the natural world by indices of scale, even if it abandoned the orientation of the viewer to their geographic locations or spatial relations in a purely idealized record of the mastery of global proportions–the illusion of a growing global mastery illustrated by the comprehending a proliferation of local qualitative detail in its frame. The terribly successful genre of mapmaking essentially offered an elegant compilation of human achievements as well as of the natural world–from the pyramids, to the tallest buildings in cities, and highest ascension made by a voyage in a helium balloon. Despite its encyclopedic scope and the range of data it processed, the “table” is human-sized, a large wall-map abel to be readily scanned, in order to digest spatial immensity to a scale designed at a human dimension for exploring a virtual record of the natural world that seemed to distill a global atlas to one sheet: the findings it collated derive from first-hand observations, each concretized in a clearly pictorial fashion so that it can be immediately recognized and understood. If the aerial triumph of ballooning as a transcendence of the everyday was well-known from the late eighteenth-century aerial flight over the English channel by a French-American team, accomplished in 1785, the flight of the hot-air balloon was an emblem of the national transcendence offered in the comprehensive map. 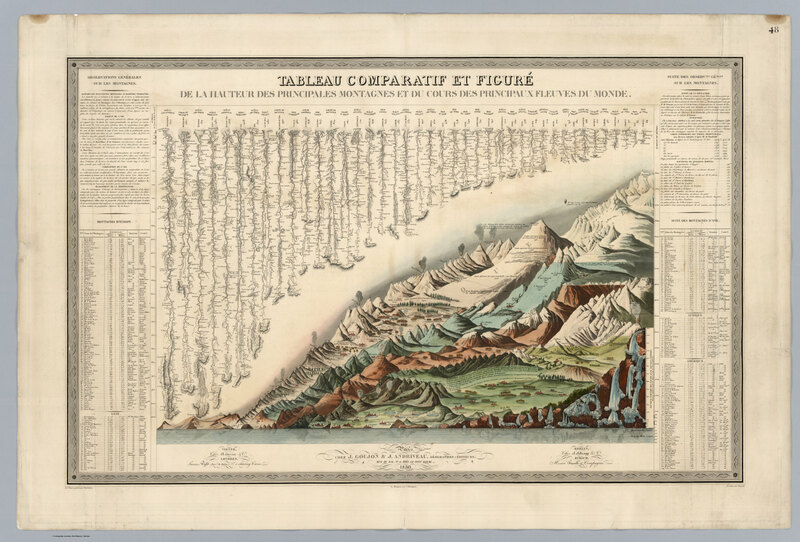 The most striking single detail that dates the map is the place it accords Gay-Lassac’s recent triumphant ascent to 7000 meters in a hot-air balloon of 1808, noted in the sky of the Tableaux, just above the mountain range of the Himalayas. 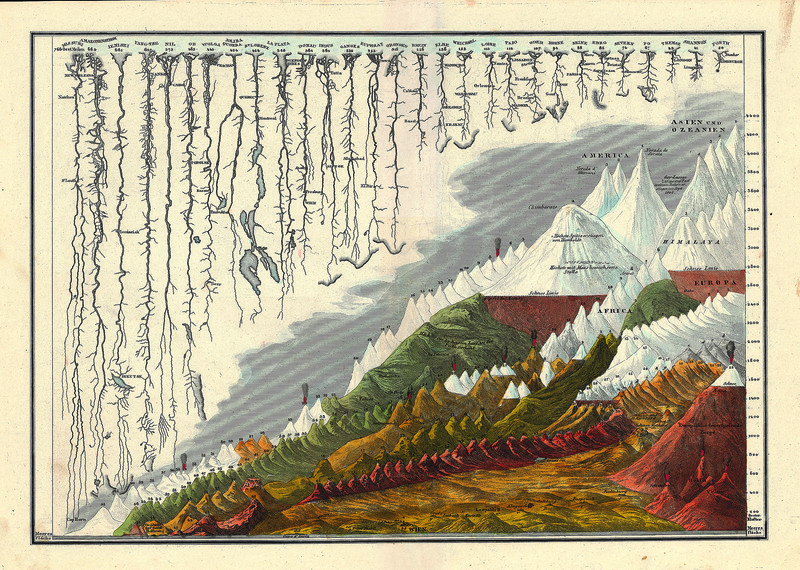 Perhaps more importantly for readers, the height of the balloon was just above the highest elevation that Humboldt himself had climbed (5914 feet), as well as the highest levels at which vegetative life–for lichen, 5488. As it rises above this barrier of living vegetation, and beyond the furthest height of the German explorer, the lone balloon is a triumph of the modern world, and an exploration of the unknown that was great as the ascension of peaks or waterfalls. The balloonist suggests a sort of French victory in the transcendence of previous bounds of knowledge, and a sign of national pride for the Andriveau-Goujon workshop (fl. 1805-94). Readers of the map could not only recognize the transcendent flight of Gay-Lussac, but could project themselves into a range of comparable adventures. The map is not in any familiar sense a projection–or a uniform transference of a conformal expanse to fixed bounds. There’s not even a pretense of uniformity in the map, because the assembled landscape discards usual cartographical operations that ensure continuity, fix orientation, establish directionality, or claim exact measures of adjacency. All are sacrificed for one criteria of scale–height–that provides a lens by which the cartographer’s fantasia of representing how space can be viewed. The notion of such a mental transcendence of space-and idealization of the basis of knowledge–was of deeply Humboldtian spin, and rested on his neo-Kantian comparative categorization of the relative height at which he scaled Mt. Chimborazo to place it in the context of the scaling of Mt. Blanc, Vesuvius, and the elevation of Quito. Unlike Humboldt, however, the atmospheric ascension of the balloonist implies an imagined prospective of an actual landscape, where the pictorial embraces, domesticities, and processes the comparative, and presents a pictorial unity of comprehensive scope–in ways that echoed how the prospect of ballooning was long associated with maps. The synthesis is truly cartographical because of how it “writes” space against uniform indices to offer a domestication of geographic diversity and variety within the inhabited world–even while abandoning actual inter-relationships. A fantasy of mapping, stripped of coordinates, enlists the familiar repertory of cartographic conventions of accuracy to offer a compendium of statistical knowledge. The cartographer abandons the usual cartographical conventions of noting spatial orientation, directionality, or adjacency, as well as cartographical signs, but transfers statistical measurements to a pictorial view in which heights can be viewed in relation to one another. This popular format of mapping uses our familiarity with mapped space to sacrifice the need to record or establish location to fashion a comparative collation of known topographic variations. Optimistically, it shows the world as a unity and unified landscape, without divisions of nationality, in a project in which knowledge about the world is curiously disembodied (in numbers) and re-embodied in a single tableaux. Although there are no recognizable cartographic indices in the, the Tableaux comparatif reveals a familiarity with the collation of information in mapped space, rising above the range of important cities that formed points of spatial orientation on most maps–including, but by no means limited to, Paris, Rome, London, Geneva, Mexico, Bogota, and Quito, among others, that were noted prominently in the various maps and pocket atlases that its printers also produced, Whereas most maps map itineraries, routes, pathways, or memorable sites of human interaction, the Tableaux is a compendium that draws from different human experiences, correlated with one another in a space that does not exist, but assembled in a single whole. It is a sort of surrogate for the totality of what we know about the inhabited world and its bounds, and the victory of the diffusion of a form of cartographic writing: its readers were able to place each of the world’s greatest rivers in their geographic situation, but now afforded a chance to measure (or rank) the Nile beside the far longer Amazon and Mississippi, in order to decontextualize and historicize the limits of global knowledge. As the ascension of the balloonist occupies a crucial pride of place in the 1834 map, verticality is the implicit theme of the map, which registers heights and lengths, to be sure, but focussed on the collation of knowledge by elevations, including forest lines, barometric readings of the elevations of cities, and heights of mountain ascents to make it a repeated object of visual curiosity. The Tableaux stands as the culmination of known science, and the triumph of the map–and Geography–as a subject able to comprehend the physical sciences. One might take the map may be a final redaction of the Ortelian ecumene (the inhabited world), which it processes for the mind’s eye, but takes the idiom of a pictorial landscape to decontextualize the abstracted record of geographical knowledge. And also to the observer’s eye: for the data accumulated and synthesized is clearly both “figured” and “represented” to be readily recognized by viewers familiar with maps. The synoptic register of mountains, rivers, waterfalls and rivers that exploited the four-color potential of maps. The image was based on a map first assembled in Paris during the 1820s, before being widely reprinted in schoolbooks or atlases through the century as a compendium. Inscribing the landscape with remarks on vegetation and marking the turning points of ports on rivers, which the cartographer has straightened for adequate comparison as if from a laundry line, the picture is a representation of the use of the inhabited world as well as of the limits of its inhabitability. The collage-like landscape, if an impossible landscape, to be sure, boasted its accuracy and transparency in the manner of a geographic map. Indeed, rather than use a directional frame, the Tableaux is strikingly framed by statistical tables that serve as the basis for its ordering of space–an imaginary space, that compiles locations in relation to one another, without correspondence to actual directionality or adjacency. Adjacency and orientation are sacrificed in the hope of registering human measurements and achievements of measurement, conducted “après les observation des plus savants voyageurs” with the truth-claims familiar from geographic maps, but by expanding its level of synthetic view and the scope and range of its qualitative content o a degree that few earlier geographic maps had ever dared. By collating these measurements in a truly utopic map, the cartographer transformed these multiple observations into a single scene that viewers could readily survey–in a supremely confident of compendium of collective observations that demand our trust, and promise to enlighten ourselves about the world’s entire form. The arrangement of these observations in a map allow us to measure distances in ways that were not possible, moreover, in a simple map: in a map, we see a river, like the Nile, as difficult to measure given its many twists and turns to its source, but all–even the Amazon–are now laid out in their relative lengths for easy measurement. This format of mapping, both for its synthetic scope and pedagogic utility, was extremely popular. All are exemplify a recognized cartographical imaginary; the geographical compendia became popular tools to synthesize information for schoolchildren at their fingertips. 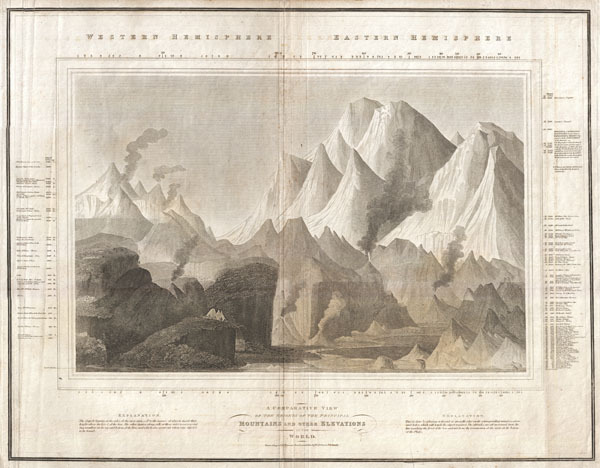 To be sure, John Thompson’s earlier undated “Comparative View of the Heights of the Principal Mountains and other Elevations in the World,” dated to 1817, presented a composite prospect of mountain tops from different hemispheres, in something of a cartographic collage that took advantage of the aesthetics of landscape to abandon the principles of coherence or spatial proximity that paramount in most geographical maps. Thompson, a Scottish cartographer, united the relative heights of the mountain tops of the eastern and western hemispheres, comparing the presence of buildings, cities, vegetation limits, and even fauna in an aestheticization of empirical observations that bridged Ecuador’s Mount Chimborazo, beside which flies an Andean Condor at an altitude of 21,000 feet, and figured Alexander von Humboldt himself scaling the peak, as well as Lake Toluca, Quito, Caracas, and Mexico City, in the same frame as Nepal’s Dhaulagiri, 27,677 feet–promising a global prospect if without either the Chilean peaks or Himalayas. If the map of mountains echoes Humboldt’s maps of mountains, Thompson had issued the first comparative atlas of rivers–“A Comparative View of the Lengths of the Principal Rivers of Scotland” which had a purely choreographic intent, in 1822, in one of the first comparative river chart of the century, just after his inclusion of the comparative chart showing the height of global mountains for the 1817 edition of his “New General Atlas” (Edinburgh), which built on Humboldt’s 1805 work–and also acknowledged that dependence by including Humboldt in his map, scaling Mt. Chimborazo. The map of Scotland’s rivers offered an even more pictorial rendition of the many rivers that watered Scotland’s heaths–and is striking for representing the same sort of Kantian transcendence that inspired Humboldt’s own work. 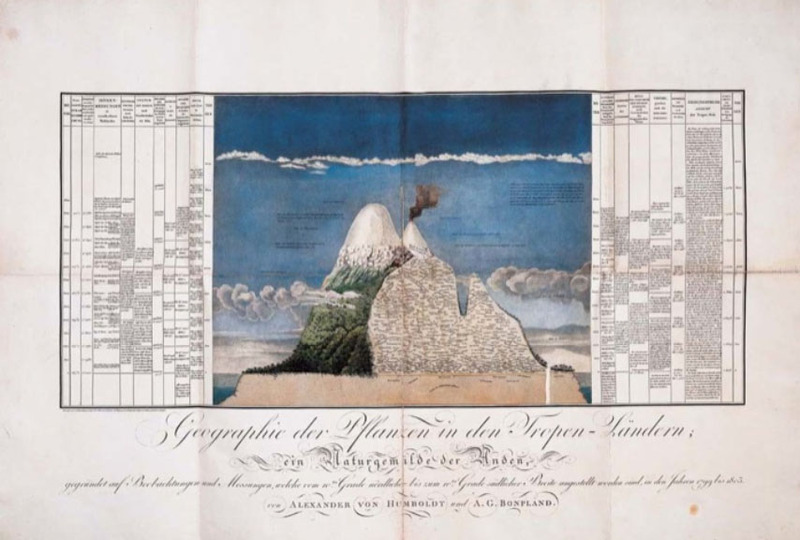 But the esthetic appeal of the composite map’s original designers and cartographers, Bulla and Fontana, had designed it in the 1820s as a landscape for viewers to enter and explore in ways that Thompson did not fully exploit, so careful was he to preserve and synthesize the newly arrived data of naturalists. The slightly later Bulla and Fontana Tableaux comparatif retains the four-color format of printed maps; the original Bulla and Fontana from 1826 was exquisitely hand-colored in a range of manners that spectacularly heighten its coherence as a landscape that is inviting to the eye: the warmth of these hand-painted colors is hard to ignore, and contributed to how the map was cast as a landscape picture. The set of impressive rivers that emerge from the upper edge of the Tableaux extend, for example, from a grassy region near their mouths, the waterfalls are thunderously crashing with white spray, the snowy peaks with their blueish hues imposingly weigh heavily upon the stoney landscape beneath them: the mountain ranges indeed fill up the yellow frame of measured indices, which serves as a pictorial frame for the scene, unlike the neo-classical border that frames a band of white in the later Tableaux. In Bulla and Fontana’s map, the icy light-green valley underneath the mountain ranges invites eyes,and suggests a reserve of ice from which one can believe the set of lengthening waterfalls contain the freezing cold run-off of icy plateaux. It seems that this wonderful post-Enlightenment map not only synthesizes measurements, but presented to the post-Napoleonic Europe the harmony of a state of total geographic knowledge as another green world, in true Renaissance fashion, in a sort of bucolic land that was both richly irrigated, filled with waters indicated by the synecdoche of waterfalls,and ready to be cultivated by man, even as Europe had been dissolved by wars and the migrations of soldiers and military campaigns planned in military maps. 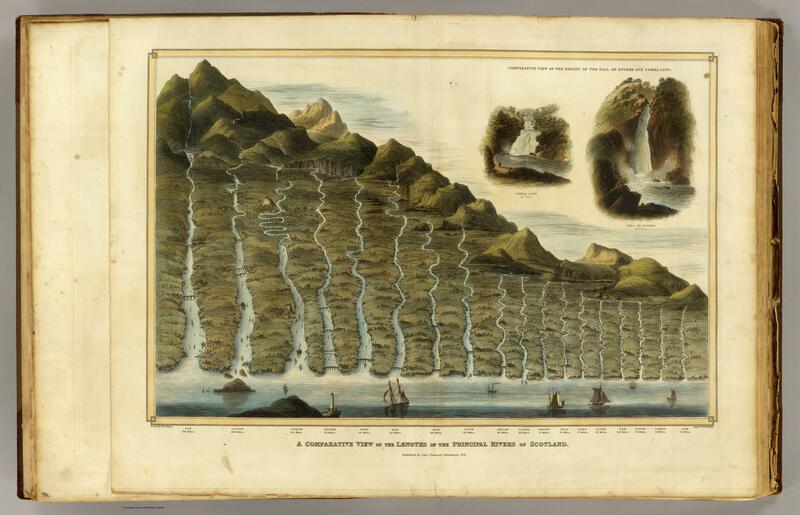 The 1836 expansion of the comparative chart of mountains, rivers, and waterfalls engraved was produced by the prolific cartographic partnership Goujon and Andriveau, and proved particularly popular–meeting a clear demand for the investigation of natural spectacles such as volcanos, whose synchronized explosions are rendered on the visual center of the map that claims one’s visual attention in almost all of its parts, echoing the memory of the global influence of the eruption of Mount Tambora during the Napoleonic Wars, perhaps illustrating a sense of the climatological inter-relations even in a map that abandoned the rendering of accurate geographical relations: volcanoes almost provided an acknowledgment, almost, of knowledge of the ecological complexity, after actual inter-relations had been abandoned in the name of the economy of map-engraving. Both include the easily overlooked detail of the balloonist who surveys the landscape. The balloonist seems to be something of the hero of this scene, who has not only entered into the picture but, in one’s imagination, is able to survey the entire expanse that lies below. His view would be what would look more like a map, even though what we see reflects the range of geographic knowledge that we can collate through our own unsurpassed cartographical abilities.